This was supposed to be a chill-out holiday. Our daughters were oppressed by the miserable London summer and wanted to catch some rays, so thought they might join us somewhere hot. We had no such plans, but a friend has a holiday home on the Costa del Sol, in Velez-Malaga, so we borrowed that for a week’s relaxation. Unlike Malaga itself, it’s very unaccommodating for the English tourist, though there is Ye Olde Red Lion pub run by an English family to supply contact with the Anglophone world which seems to be otherwise absent. This isn’t a blow by blow account, as there are few blows to be told. So, the main action was getting to our holiday home, which I’ll enliven with a few holiday snaps. 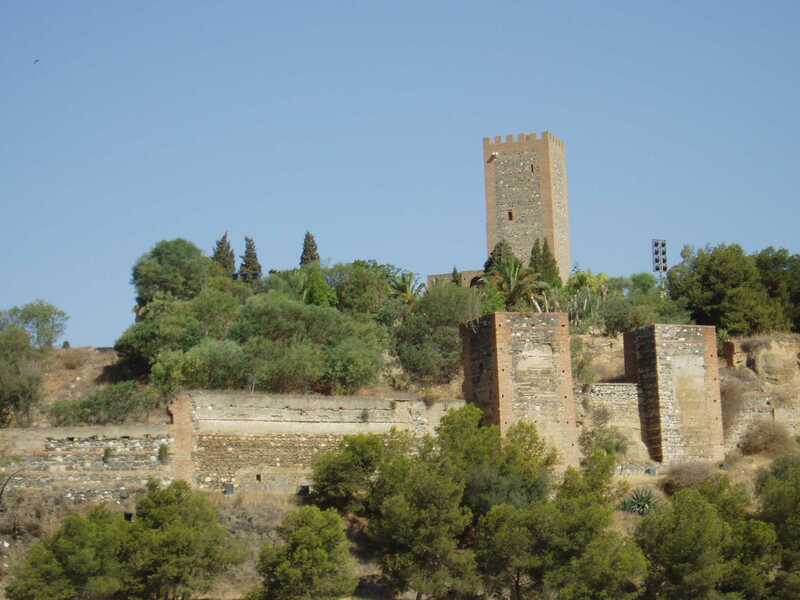 … the 10th century Moorish castle viewed from the same vantage point later in the day. As alluded to above, the main story to date has been the immense trauma (for me, at least) of finding our way to our holiday home at Velez-Malaga. This is mainly due to three factors. Firstly our collective incompetence in the local lingo. The second was the terrors of driving in Spain. The third was the elusiveness of our domicile. No doubt many would have taken the driving and the roads in their stride. I’d volunteered to do the driving as a way of avoiding the guilt of having culinary skills of the same order as my relevant linguistic ones. My rival in the culinary department had been detained at home by reason of a new job, so I felt exposed as a useless appendage, wallet apart. Unfortunately, I panic. I think my intellectual qualities are second to few, but they don’t extend to having a clear head in a tight situation. If a puzzle is tricky, but I’m not hustled, all can be fine; fun, even. If the situation’s life- or ego-threatening, and there are spectators, however well-meaning, I get into a flap. I’m also easily taken for a nasty ride by the sloppy providers of unclear or erroneous instructions. We’d arranged for a car-hire, to be picked up at the air-port. Julie had ordered this, and, as the “second driver” hadn’t checked that it was an automatic, our preferred mode of locomotion for the last 15 months. But we’ll come to the dire consequences of that decision in a minute. I had anticipated the problem on the day before the holiday, but by then it was too late or too expensive or too confusing to do anything about it, so our travel agent said. Anyway, even picking the thing up as ordered was a frightful nightmare (which reminds me, I haven’t had that nightmare yet, probably because the worst possible consequences of the non-resolution of that particular problem would have been slow starvation at the airport, which is difficult to fit into a night’s sleep). The instructions were clear. There was a desk on level 1 of Terminal 2. On the way out of the arrival bay, just before where all the pick-up drivers wait expectantly for their delayed charges, there was a sign for car-hire pointing down a ramp. Since we were on level 1 already, this couldn’t possibly be for us, so we went through the fateful exit. I hadn’t realised that it would have been easier to return from bursting through the doors of Hades, but we were then jejune in our understanding of Spanish ways. Well, we couldn’t retrace our steps, despite virtually circumnavigating the airport encumbered by mounds of baggage (I’ve skipped over the good bits: our stuff had not been returned to the UK on the flight to Doncaster, so not everything went wrong), and then having to struggle back in the unbearable heat going in the opposite direction to everyone else; a clear example of the chief doctrine of resistentialism, “les choses sont contra nous”. 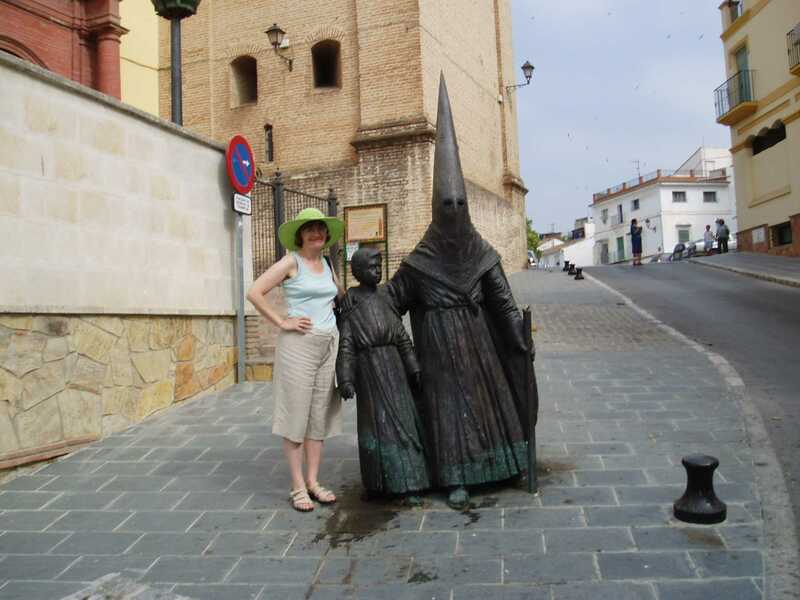 Our return was finally blocked at the pearly gates, so we returned to wandering about in the outer darkness with the girls trying out their halting Spanish on a sequence of distracted or malicious functionaries. We eventually learnt the error of our ways. Our instructions had been short of a minus sign, though even that referred to the level of the location of the car-park. I’ve now forgotten, given the endless lift-journeys and flights of escalators leading to dead ends, quite what level we found the pick-up desk on – I suspect it was level 0 – but Julie and I decided to leave the girls there next to our likely car (the car-company’s logo was clearly emblazoned), and followed a lead provided by some friendly compatriots. We found another entrance to the enchanted forest, guarded by a friendly but intransigent ogre in good command of English. On the way there we remembered we’d forgotten our passports, and then our cash. On the third attempt we found we needed our boarding passes. By some miracle Julie hadn’t recycled her’s. I never recycle small slips of paper, as they are invaluable as book-marks, and mine was at that moment doing duty as such in a copy of Seneca’s essay “on the shortness of life”, which I’d been reading on the plane over, in between further courting the divine wrath by writing critical notes on Genesis 1 while bobbing up and down in the turbulence over the Bay of Biscay. Normally, I go nowhere without a book, but in the general flap I’d left it with the luggage, so had to make a third trip back to the car park. Equipped with the magic password, we gained admittance and the opportunity to join a short but utterly static queue behind a crowd of Americans. Quite what the three girls behind the desk were doing was impossible to fathom, but it seemed to involve animated conversation into mobile phones, sometimes into several at once. I presumed that if this activity hadn’t been legitimate the Americans would have given someone the opportunity to make their day, so we queued obediently awaiting the age to come. Julie was concerned that the girls might spontaneously combust in the heat of the car park (in fact they had come for the heat and were quite happy, even instructing us to turn off the air-conditioning in the car when this tale reached a happier stage). But mobile communication was established and the girls agreed that they wouldn’t after all bring themselves and the luggage to the air-conditioned lobby guarded by the friendly ogre. … the tower of the 16th century church of St John the Baptist viewed from the same vantage point. Eventually, all the girls behind the car-hire desk reanimated all at once – I couldn’t prove that they’d been phoning one another, and on reflection, it wasn’t very likely – and we swarmed to the front of the queue. The low spot was being diddled out of 50-euros’ worth of insurance. We’d been warned against this by the travel agent but I was caught in an eyeball-to-eyeball by the girl behind the desk, who unfortunately spoke good English, and threatened that if I as much as squished a tyre against the curb, I’d not see a cent of my 600 euros deposit. However, I could indemnify myself from this deprivation by the expenditure of such a trivial sum. Subsequent events have proved this to be a wise choice. So, we got our car-key after I’d signed one form wrongly in three highlighted places, and then signed three forms correctly in unhighlighted places, and loaded up the car. By this time there was a collective desire amongst the female contingent for a trip to the ladies, which gave me half an hour to study the controls of the car and get the TomTom working. The TomTom had itself been a bit of a saga. We’ve found these devices immensely useful, though there are parts of Essex that don’t seem to map to the world as seen from the GPS. Unfortunately, ours only had a map of the UK, and when I tried to download the map of Spain, found that we needed an extra 500 Mb of space, but only had 5. So, an order winged off to Amazon with a week to spare for the appropriate 2Gb flash-memory card. Followed by a chaser and a promise of “it’s in the post”, followed by the disappointed stare at the empty doormat on the day of departure. Thankfully we managed to borrow a TomTom from the friends from whom we were borrowing the apartment, leaving our diminutive version as a hostage. We were now ready to start our journey. By this time it was about 23:00, and we were all somewhat tired and fraught. I cannot imagine how there aren’t loads of fatalities caused by incompetent tourists lost in charge of strange vehicles. The first trial was to escape from the car park. There were some impediments. As already noted, this was a geared car, and I’d had my brain re-wired to drive an automatic. Secondly, it was a mirror-image of any car I’d driven before, with a gear-lever sticking out of the dashboard on the right-hand side, with me in the passenger seat. Even in my own car I confuse the windscreen wipers for the indicators if I don’t have time to think, so the opportunities for comedy abounded. The situation was intensified by the fact that, while we were supposed to have a quarter-tank of diesel, the documentation and the gauge forbiddingly said “empty”. So, when we stalled about 15 times in succession trying to circumnavigate the car-park, this was the initial diagnosis. In fact, after I’d pulled myself together after all the flashing from the queue of traffic behind me, I deduced that I must have been slipping into third gear, which was in fact the case. I’ve still not quite got the hang of the gears, but over-compensation usually works. I’m sure that most alpha-males find all this second nature, but I don’t, especially when the life and limb of most of my family depend on my competence. So, pursued by the flashing lights of irritated locals and more competent tourists, we eventually emerged out of the airport and on to the motorway. The TomTom wasn’t working, but for a while we lived in hope that we were heading in the right direction. We weren’t. Before long, however, we came upon a gas station that enabled us to replenish our dwindled supply of diesel, and during the stay, the TomTom eventually sprang into life, and we found we were on the right road, but heading in the wrong direction. Not that filling up was that uneventful. We tossed a mental coin as to which side the petrol cap was on; we lost, so after a shuffle we attempted the filling up, but the pumps don’t start in Spain until you’ve left a credit card as hostage, and not even then if the attendants are forgetful. But, after multiple trottings to and fro, all was enabled and another peril circumvented. Thereafter the route to Velez-Malaga was plain driving. We managed to find the occasional cement mixer or other timorous tourist to follow to avoid moving out of third gear. Then our troubles really began. 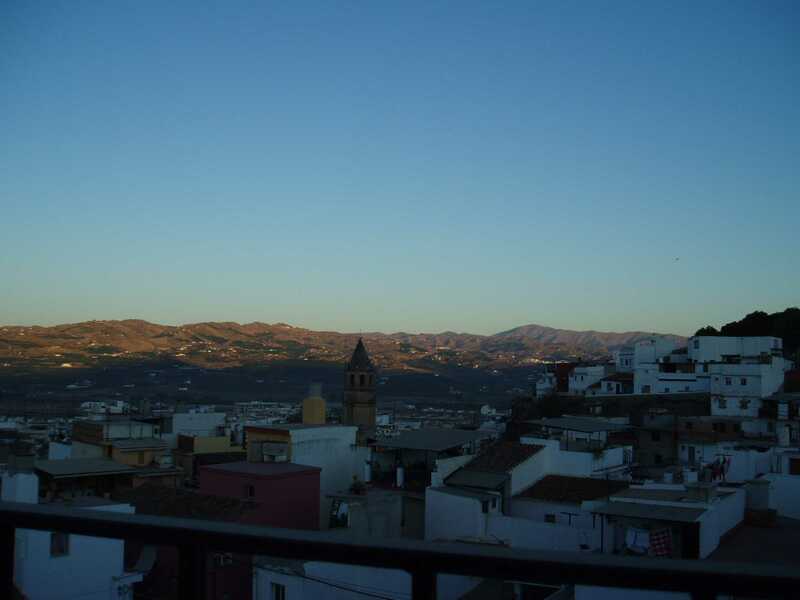 The town is an ancient Moorish foundation with a castle, very hilly with no observable street plan, narrow streets with parked cars down one side, and undergoing intensive redevelopment. We were to stay in a recently-renovated town house. Unfortunately, all the roads in this part of the town seem to be called the Spanish equivalent of “Fire Hydrant”, and the TomTom was utterly confused by the road plan. We’d been told that we couldn’t park outside the house, but had to park by some bins beforehand. This wasn’t exactly a definitive location, but we concluded that we were near our destination when the TomTom went into a loop, and additionally we heard the sounds of goats, another locational clue. … Julie admiring the foliage at the Ermita de las Virgin de los Remedios. So we circumnavigated our unknown destination at 1:00 am through the never-ending one-way system. I’d not quite got to grips with how far the car extended to the right, and at one point managed to scythe off all the wing-mirrors of a row of parked cars; at least it sounded like that, or would have but for the shrieks of my passengers. Eventually we found what we presumed must be the right locale (because of the goats), and Naomi and I set off on foot armed with the TomTom. As previously noted, it had given up the chase, and just directed us round in circles, but fortune was on our side in that we ran into a bunch of Spanish widows enjoying a post-midnight feast of fish and chips, seated on garden chairs set up in the middle of the road. They were immensely friendly and helpful, but were excited by Naomi’s “un poco” into utterly incomprehensible machine-gun Spanish. Despite the fact that it was obvious we understood not a word, they rambled on helpfully on subjects we knew not what. But eventually, they gave up on this, and led us to the road, and then to the door of our future abode. It was down a road that I’d assumed was someone’s drive, so if we’d never come across these helpful relicts, I’ve no idea how we’d have found it. But it was close to some bins. Unfortunately, the bins were on a steep slope, and I whizzed past them before realising I had to park. Now my hill starts have never been wonderful, and reverse hill starts in a strange car with dodgy gears must have been provided a paroxysm of entertainment that would have delighted those who remember the Reginald Molehusband advertisements. Neither the passengers, gears, clutch, tyres or goats were amused, but thankfully there were no other potential auditors hiding by the bins. So, we parked at some odd angle and staggered back to the house loaded with suitcases. I noticed that there was a sheer drop at one point on the side of the road, guarded by a wire fence that I imagined wouldn’t be proof against my ferocious reversings. So, I was glad we didn’t have to take the car round (we’d been warned against it), but this didn’t stop me having nightmares as I imagined plunging into the abyss lit only by a flaming clutch-plate. Thereafter, there were only the usual problems on entry to an unknown holiday home – finding the mains switch and the bedding, failing to find any water, confirming that the light in the loo doesn’t work, and flopping into bed in the scorching heat (I was too frightened that the fan would fall off the ceiling and mince us in the middle of the night to leave it on), to the music of the world’s noisiest fridge. But a more welcome and refreshing night’s sleep I cannot remember. The rest of the holiday was fairly routine, though blighted by the troubles I was having with the car. 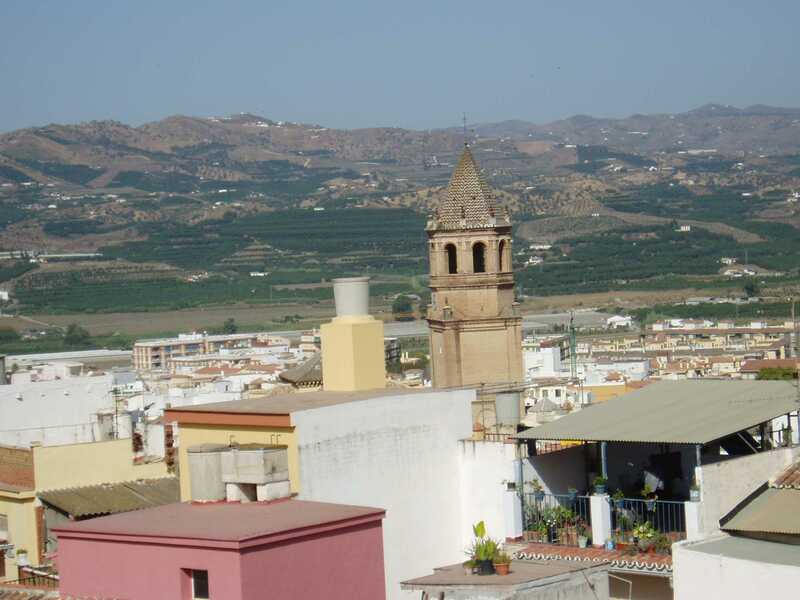 We got our bearings in the end, but only made it by car as far as Torre del Mar, which is only a few miles away on the coast. Mind you, we parked at the end of the world, and enjoyed a rather second-rate and extortionately expensive meal on the sea-front. We still had the most difficult trip to the supermarket in the history of mankind on account of the one-way system interacting with the road-works which meant that all the normal routes were blocked. Previously I’d missed a turning, which by a complete accident had enabled us to get there without much trouble. The second time took an hour, as I didn’t miss the turning, but was directed to a variety of dead-ends and loops, as well as making outright blunders due to absent signposting, which included a journey over a local mountain and another trip to Torre. At least the place was still open when we got there. On our last day we eventually found the tram we’d been hunting for all week, which links Torre to Velez-Malaga, and Julie and I enjoyed a leisurely trip there and back. Julie engineered a minor hiccup by trying to provide the “exact change”, which turned out to be half what was expected. We had a very pleasant seafood lunch at a reasonable price in an air-conditioned restaurant. They are supposed to cook sardines on the beach, but it was too hot. In any case, though we saw some fires being set up on beached boats, there was no sign of any cooking on them. Maybe they were being set up for the evening. There was one final driving drama on the way home. We’d been assured that returning the car was simple and would take 5 minutes. We didn’t believe this, of course, but it would have been within our estimated 15 minutes if we hadn’t sailed past the sign to the right car-park and ended up in the wrong one. As can be imagined, getting out of that was far from simple, but was eventually achieved against all the odds. A get-out-of jail card was purchased from some helpful attendants, and the lady on the exit was eventually persuaded that it was indeed a valid ticket, and off we went for another try. Thankfully, this went virtually hitch-free, apart from a failed attempt at parking in an impossible berth (some rival tourist had pinched ours), but I was rescued by a professional parker from the car-hire company who had the authority to choose an achievable slot. We’d less than an hour to catch the flight, but all went well as we were eventually bumped up to the front of the queue and on our way. Of course, when we got to Luton, we initially queued for the wrong car-park shuttle-service, missed the bus, and had to wait 40 minutes for the next one. But, all things considered, we got off lightly – no fatalities, accidents, missed planes or even food poisoning. We couldn’t find any respectable-looking restaurants in Velez-Malaga, so we mostly lived of salads. Having arrived safely in Luton, Julie decided not to trust that I’d immediately shake off all my driving re-wiring, and did the driving home, dropping the girls off on the way and only mounting the curb once. 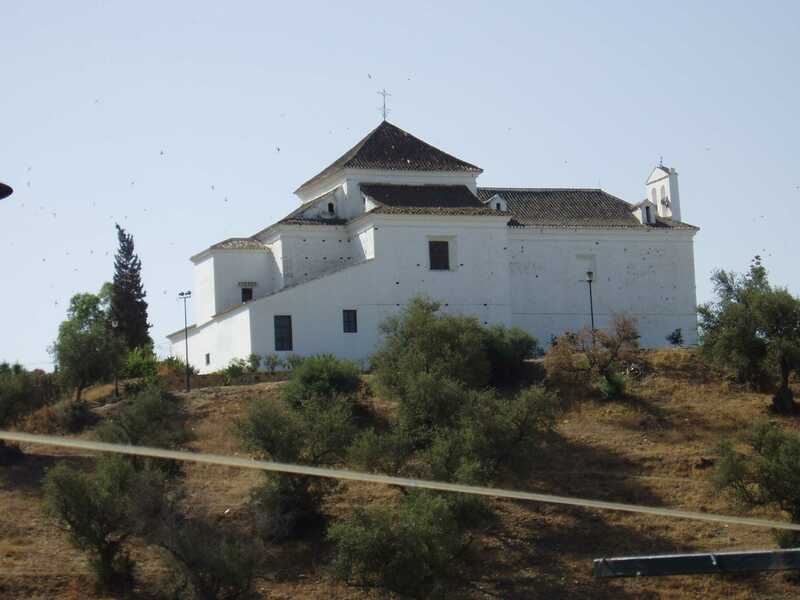 Returning to the holiday itself, probably the most interesting day was a visit to the local historical attractions – the castle, and the church and museum of Santa Maria La Mayor on the castle mount. 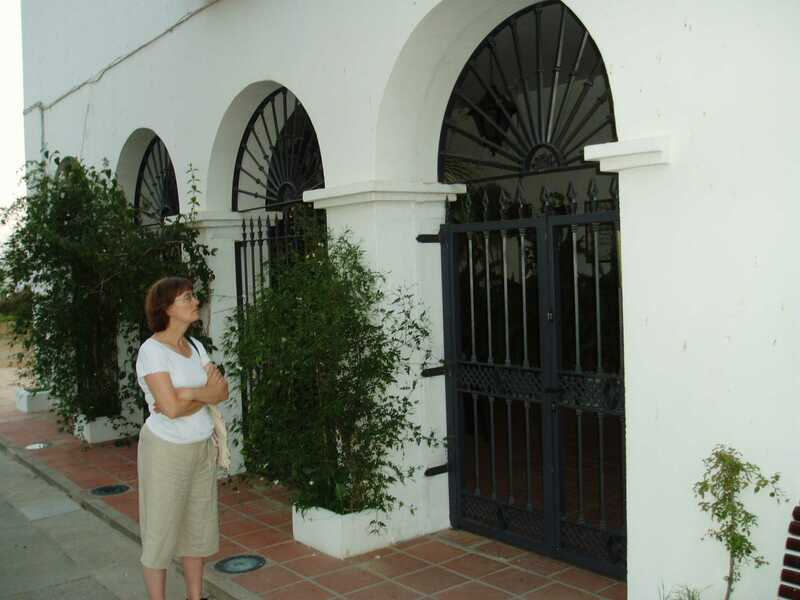 The museum was dedicated to extolling the wonders of the Holy Week celebrations at Velez-Malaga. These appeared to be extraordinarily lavish, but to the Protestant eye show many of the excesses of Catholicism. 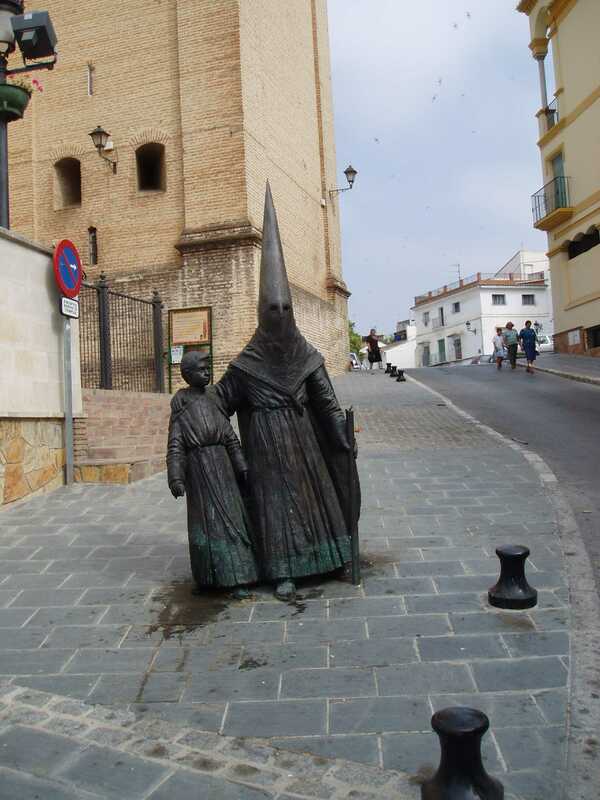 The processions are organised by 18 brotherhoods, each of which maintains its own holy site throughout the town, but more interestingly wear distinctive outfits in the celebrations. It is difficult for a north-European not to see these outfits as horribly threatening, as they look just like those worn at the autos de fe at the height of the Spanish Inquisition. (Note: I’ve tried to find a website that shows these, but have failed; I remember the get-up from history lessons at school, but maybe I’ve misremembered). 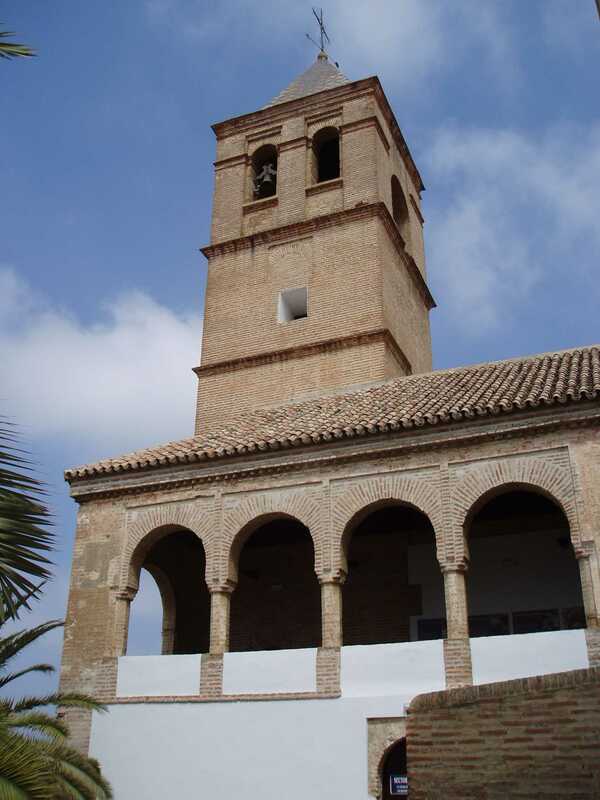 … The church of Santa Maria La Mayor. Quite why anyone would want to wear a mask with such a sinister appearance and such connotations (not to mention their use by the Ku Klux Klan) at a religious celebration passes understanding to the Protestant mind, but there must be an explanation, as it’s not a minority enthusiasm, but a large proportion of the population must be involved. There were two audio-visual presentations in the museum, together with a more detailed touch-screen explanation of the brotherhoods for those with a good command of Spanish. The showing, for which there was an English-language version, that described the history of the Holy-week events pointed out the decision of the Council of Trent to accentuate all the aspects of Catholicism that the Protestants were protesting about – including (what I hope was a mistranslation) “Our Lady’s divinity”. That is, it accentuated the visible and artistic as against the written word, and community above the individual. It seems that the masks are worn by “penitents”. If so, this seems to be a bunch of confusion. There’s no need for penitence for general sins – it’s repentance not penitence that’s required. The old mistranslation in the Vulgate – “do penance, for the kingdom of heaven is at hand” - is the root of all this muddle. Incidentally, another, more entertaining, mistranslation in the Vulgate is that Moses “had horns”, when he came down from the mount, rather than that his “face shone”, but at least this only deceived Michelangelo and a few other artists. If doing penance is an act that gains spiritual merit, then being hooded makes sense, along the lines of avoiding Pharisaical public display. But it isn’t. And repentance, or even penance for specific sins, has to be public, or have a public aspect, and it’s the public side that makes it hard. So, I think would say the Protestants, but not the Catholics. Timestamp: 06/04/2019 22:56:25. Comments to theo@theotodman.com.